Hank has been living with us for the past 3 weeks. He is our fifth dog and our third Golden Retriever. Hank is the first dog I am determined to train so that he becomes compliant and well-mannered. To that end, I have been reading several books about dog training/raising including one text by the “Dog Whisperer” and another old stand-by about raising a puppy you can live with. Hank sleeps in a crate every night which Craig calls his crib. It’s supposed to mimic the wolf caves from ancient times. Hank actually does love his crate and goes there during the day for naps. We put him to bed for the night around 8pm and he no longer cries. I am vigilant about training Hank to do his business in the outdoors. His preference is to visit the lush carpeting under the pine boughs. His next favorite are the mulched garden beds. I take him through the vegetable garden every morning where he runs up and down the rows. We have not seen one rabbit or deer in the garden since Hank’s arrival. We’re hoping the rabbits moved next door. Hank wakes up every morning around 4:30am. I take him outside and then back onto the porch. He falls back to sleep if I stay there, crunched on the small couch under a big blanket. If we’re lucky, he sleeps for another hour. Then it’s breakfast, another trip to his favorite toilette and I wake up. We go for a walk that has become a routine. Past the pond garden, around the tennis court, down the driveway (two deer ran in front of us today) and then back up the driveway. Hank sniffs around until he figures out that I am gaining. He runs to catch up and then starts sniffing again. We end our walk with an inspection of the vegetable garden. 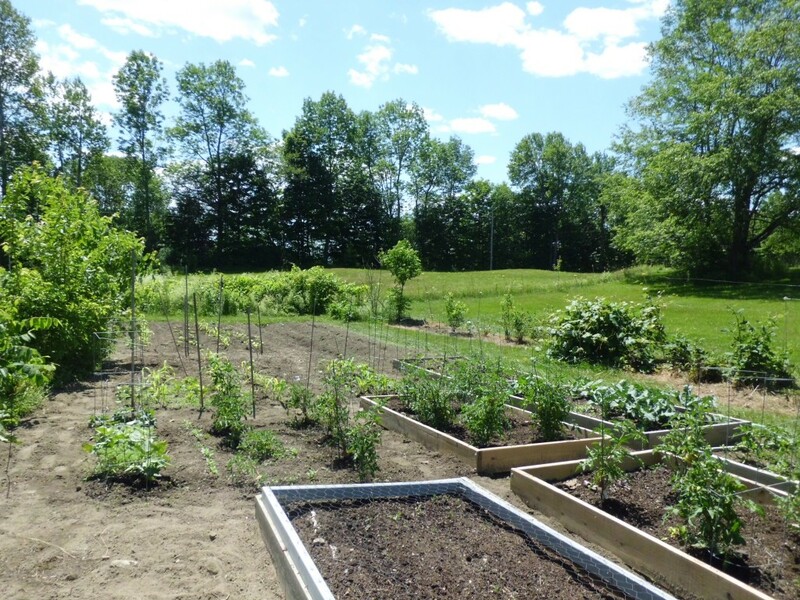 I have been picking cucumbers, green peppers, lettuce, onions, tomatoes, raspberries and blueberries. Hank runs around in the raspberry bushes and helps himself to a morning snack. We return home and he collapses for a two hour nap. I decided to take him to work at the residential treatment center last week. Used the “ask for forgiveness, not permission” philosophy. The residents jumped up and down, squealed and took turns holding Hank. I had never seen them all so joyful, caring and loving. I had the best therapy session with my client who tends to ruminate about the existential hopelessness of the universe. She was positive and smiled for most of an hour. I have decided that Hank is a natural therapy dog. He’s been great for me. Gets me walking two miles every day, watching much less tv and generally soaking up unlimited affection. Hank was born on May 3, 2012. Craig read about him in the Caledonian-Record personal ads on July 6. 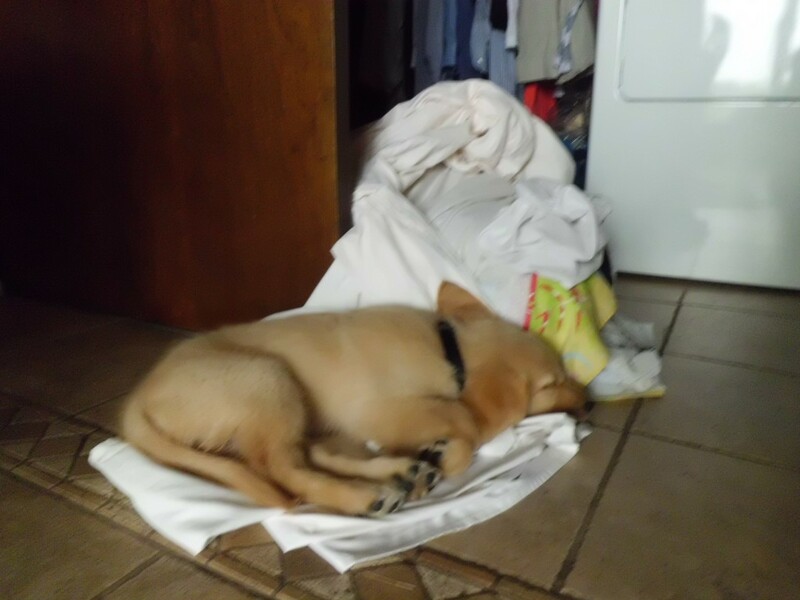 We found him in a big box with his two brothers at a yard sale in Passumpsic the following day. Love at first sight. He has brought joy and sweetness into our lives. This is Hank sleeping in the sheets. The nostalgic smell of his play-mates. Oh Hank. It’s another gorgeous, high cloud summer day in Vermont. We have been watering the garden every morning for the past week because of the heat wave. No rain for the past 10 days. Daylilies, Bee Balm are blooming. Peonies are going by. Anenome which signifies “anticipation” still going strong. 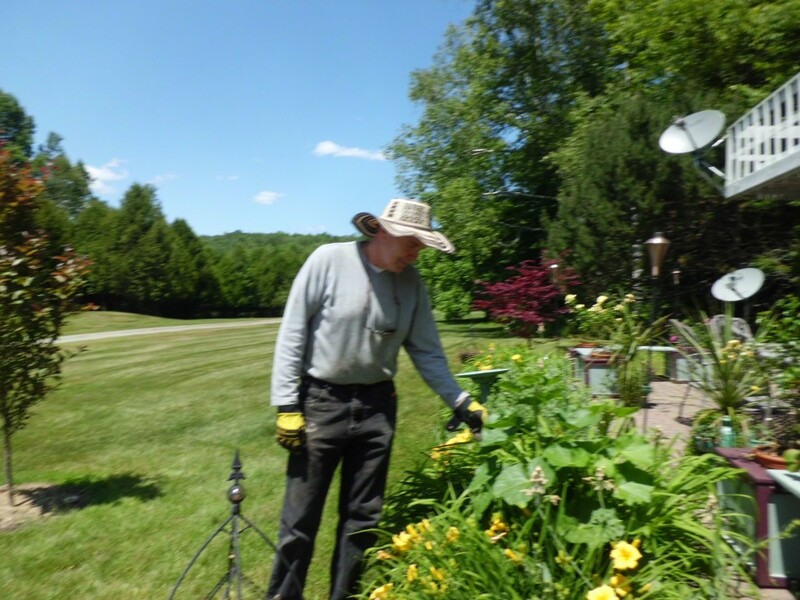 Craig weeded the entire vegetable garden with the small rototiller. We planted more beans, peas, parsnips, leeks and fennel. 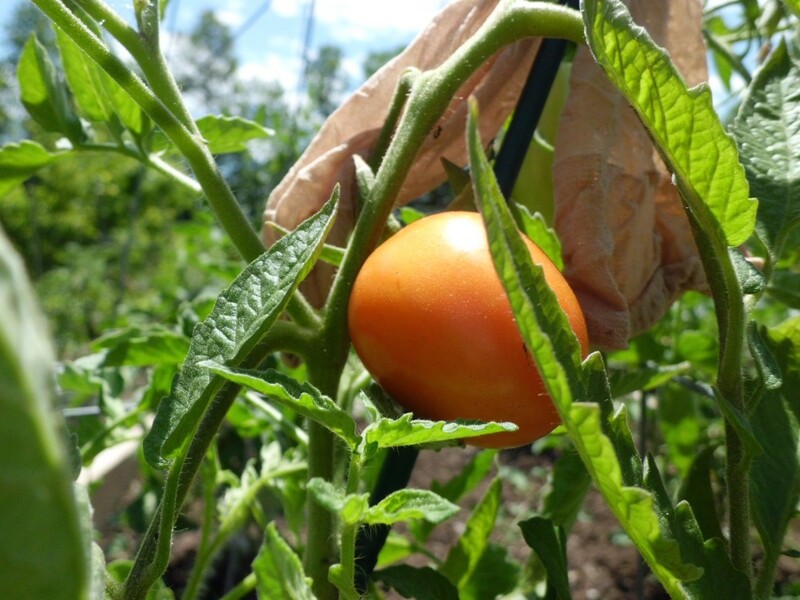 This is the first ripening tomato of our 2012 garden season. The vine is tied to the post with a slash of pink pantyhose. I think it’s festive. Fairly certain that this is a Roma Tomato. Good for sauce. 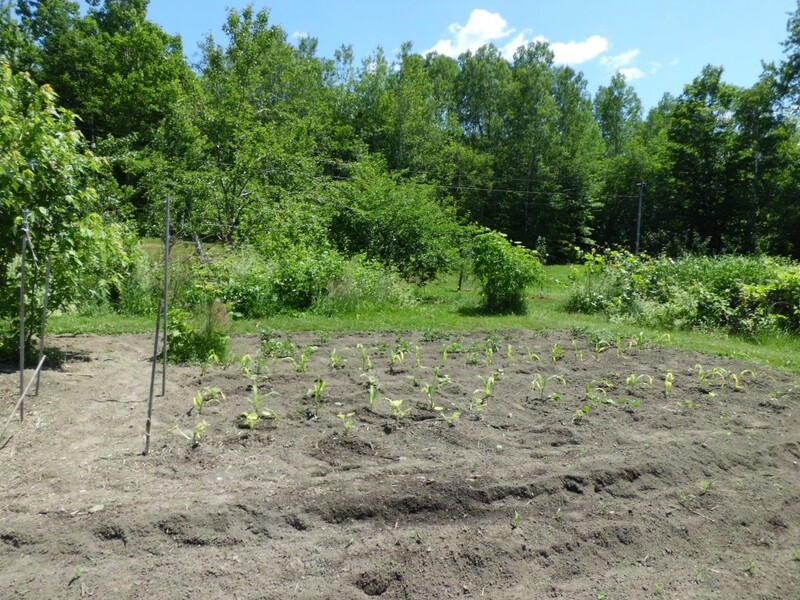 Corn, potatoes and squash plants in this end of the garden. We have finally figured out the secret of making compost. It came from the Paul Parent radio show. You add loads of grass to the tumbler which heats up and cooks the ingredients into black gold. All content ©2012-2019 Michele Authier / Sugar Glen Farm.